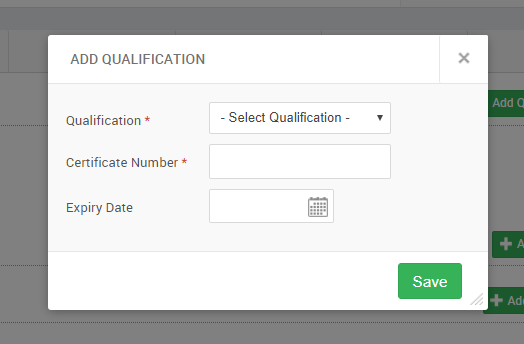 In Expertise you can view your employees certificates, training and language skills and additional information about everything - when their qualifications expire, what level they are on with their foreign languages etc. To add more expertise, click on the green 'Add ...' button in the top right corner of each section. This will open a pop up window where you can fill in all the details. When you're done, click 'Save' and it should now show up in the right section. If you wish to edit or remove an already existing section, click on either 'Edit' or 'Remove' in the top right corner, these options show up when hovered over the item you wish to edit/remove. Now that you're done with adding or updating expertise, you can move on to the next article.